Carrot cake is classic; With raisins or without; With coconut or without; with cream cheese frosting or without... all of the options can make a cake lover indecisive. Or really indulgent. So, I've just solved your problem. 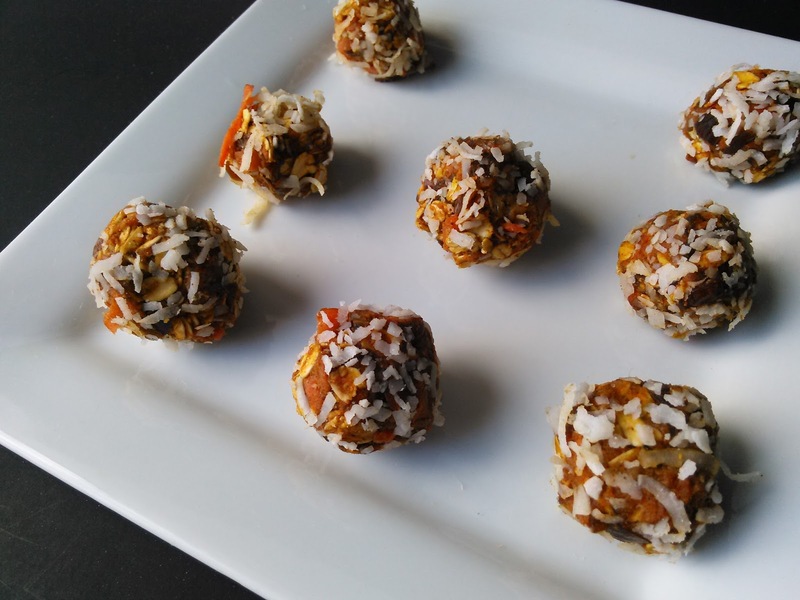 I've been seeing energy bites or balls posted on other blogs and I didn't pay much attention a first, until I realized the *I* could make some that taste just like another popular trend, cake balls. I don't understand cake balls but I understand cake and all things yummy. And these definitely qualify. They also qualify as other things as well. I remember watching my grandma make cakes during the holiday season and I was always intrigued by how she pulled everything together. My favorite part was watching grandma grate carrots and fold them in the spice-filled batter. Sometimes she'd add pineapple or applesauce. She'd use the handheld mixer to cream the butter and sugar and after that, I kinda lost interest. I made sure to visit the kitchen again after the cake was cooled, ready for frosting. I didn't and still don't care for raisins, nuts or coconut in my carrot cake but as long as it's full of dark spices and topped with some kind of sugar, I'm happy. I think you'll be happy with these bites, too. No baking, not much mixing, no cooling--these are non-cook's dream. 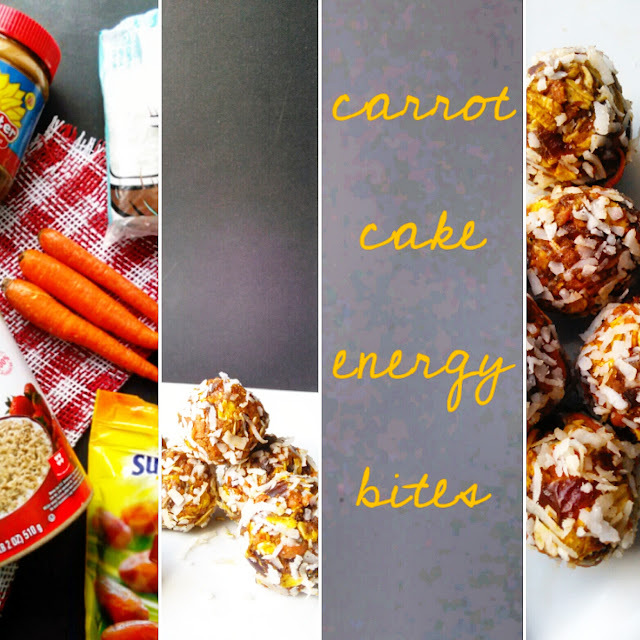 My Carrot Cake Energy Bites taste JUST LIKE carrot cake but are chockfull of ingredients made to give you energy. 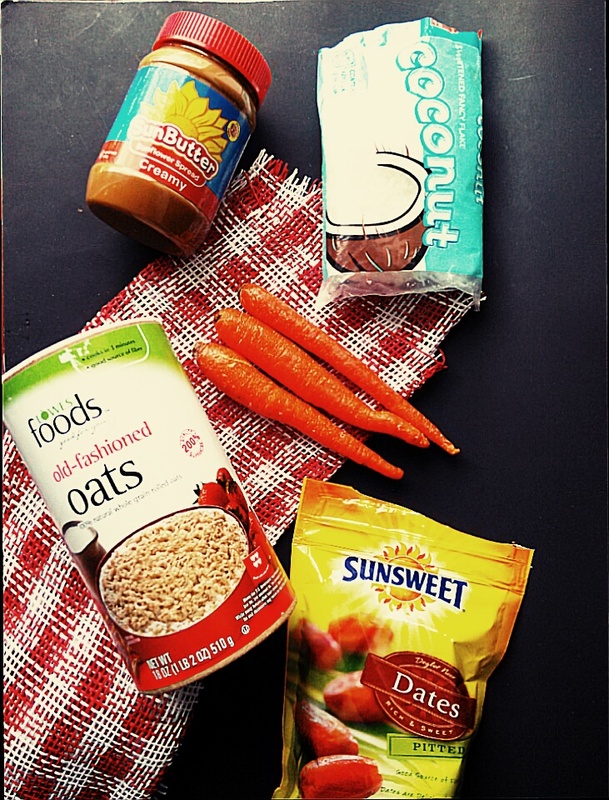 Oats, hemp seeds (flax seeds work just as well), dates, carrots and sunflower seed butter round out these little bundles of joy. Roll them in coconut to finish the beginning of a beautiful snack-ship. 1. In a large bowl, mix together the oats and hemp seed. 2. Stir in the sunflower butter, 1/4 cup coconut (if using), cinnamon, nutmeg, allspice and salt until well combined. Stir in the grated carrots. 3. Using 2 tablespoons (packed) of the mixture for each bite, roll the mixture into bite-sized balls. Use a small cookie scoop makes this part easier. Spray your hands with cooking spray to prevent the mixture from sticking to your hands. 4. In a shallow bowl fill one with with flaked coconut (if using). 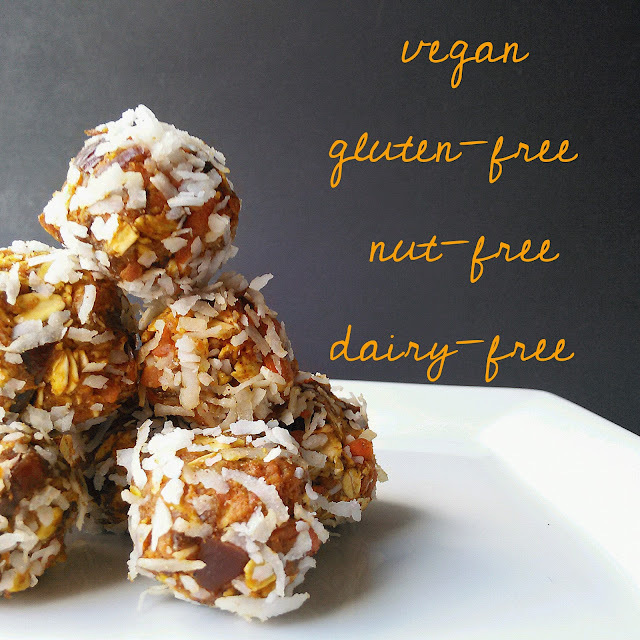 Roll the balls in coconut flakes. 5. Place the carrot cake bites on a plate or storage container, cover and refrigerate for 1 hour. Serve. NOTE: Store the remaining carrot cake bites in an airtight container in the refrigerator up to 1 week. I love carrot cake, and this is such a unique take on that flavor. Plus, who couldn't use some serious good-for-you energy!